Hi friends- I hope you enjoyed hearing from Kelly Green yesterday. 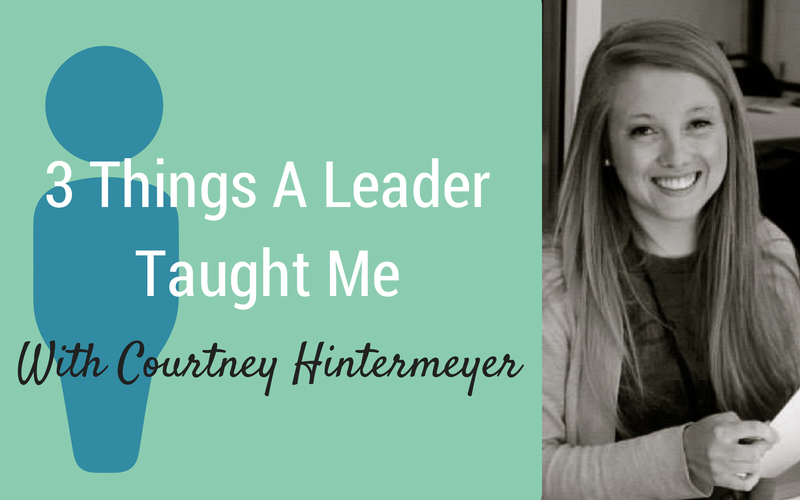 We’re talking about 3 Things A Leader Taught Me. Insights and perspectives from friends of mine who I’ve observed being mentored in unique and helpful ways. Today’s post is from my friend Courtney. Please feel free to comment your thoughts and ideas. I would love to respond when I return. I’m a firm believer in the saying “it takes a village to raise a child”. I think it takes a village to raise anyone, at any age. This is why we have our respective home teams–the people that rally around us and say “I’m in this for the long haul”. But beyond the community of people we surround ourselves with, there are a few that are different. People that are farther down the road than us. People that are willing to teach and impart wisdom. People that may not always be in our lives in the same capacity, but their investment in us will continue to expand and deepen as we grow into the things they taught us. For the past couple of years, I’ve been spending some time with a woman named Amber. Honestly, I would like to be her when I grow up, (which is something at the ripe age of 22, that I am still in the process of growing up). I have learned countless things from her in our time together, some things spoken, and some observed, but here are a few of the things that will continue to make ripples in my life, even if our time together becomes less frequent. Be observant. Often we repeat things we do without actually understanding them. Take the time to understand. Pay attention to what matters to you, and then ask why. When thinking about and planning what I want my future to look like, Amber has encouraged me to be mindful of what I have done in the past, and what I am currently doing. Have you ever heard the quote “If you want something you’ve never had, you must do something you’ve never done”? While that is true, and a significant part of the lesson, Amber has also taught me that sometimes you need to acknowledge the things you’ve always liked or been drawn to, and see what works, understand why sometimes it didn’t, and move on from there. Change doesn’t always mean an entirely new direction. Do it afraid. Countless times when I have known what the “right thing” was, it came paired with anxiety and fear. Rather than waiting around, where those feelings would naturally snowball (have you ever played the “what if” game?) Amber has encouraged me to move through my fear and take intentional steps forward. Sometimes an “intentional step” means a huge leap of faith, and learning about trust. Show up. Simply showing up matters. It matters in relationships and in your work. It matters so you don’t wake up in 30 years and realize that you haven’t been present for one moment in your entire life. Things that matter, often take time…so you have to show up, consistently–for you and for others. Amber values what is important to me, and showed up at my first gallery show displaying my art. That was more encouraging than anything she could’ve said. These three things aren’t lessons you learn and check off a list. You have to let them sink in and work their way into your day to day living. Looking at my own life, I realized I had always really cared about people, and their stories, and I admitted to myself that I had always wanted to be a therapist. That realization was scary for me, it meant I needed to make a change, a big one. So, I “did it afraid”, and quit my job to go to grad school and pursue an MA in Professional Counseling, and am working on showing up for my life everyday. Life: It’s a process, and it takes a village. Because of people who are willing to come alongside of us and pour into the people around them, we have to do a little bit less of it alone–and that is something worth showing up for. Thank you Courtney for your honesty and bravery. I can’t wait to hear more about your journey. Courtney is originally from Minneapolis, MN but finds herself making a home in Atlanta, GA with her two fabulous roommates. She loves the more ridiculous things of life, and is often found longboarding through her neighborhood eating an ice cream sandwich. Courtney currently attends Richmont Graduate University, pursuing an MA in Professional Counseling. She thinks out loud on Twitter and Instagram as @cjhinter.